Wear your baby's initial and birthdate, grandchild's initial and birth date (or child of any age who will always be your baby) paired with a vintage blue lilac stone for boy or pink stone for girl. I can also substitute the stone for others from my collection. Please mention initial and birthdate in "notes to seller" during checkout. I make this personalized jewelry for mom with child's initial hand stamped on your choice of a gold plated or silver plated disc... I hand stamp the birth date on your choice of a brass oval or silver oval. 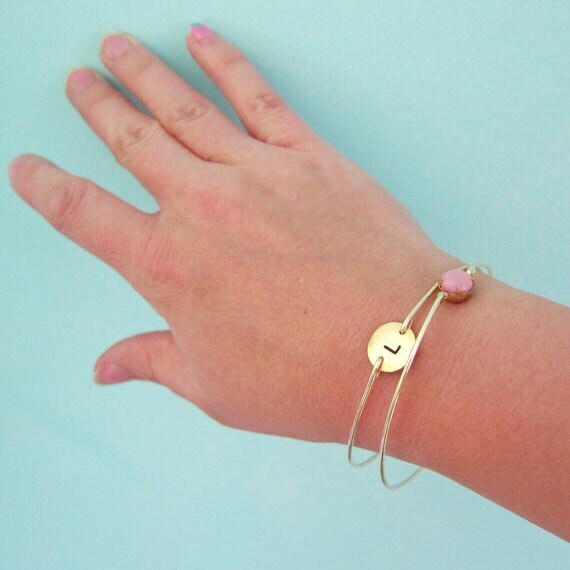 All pieces are paired with matching gold tone brass or silver filled bangle bands depending on the finish you choose. I can also make these personalized bracelets for mom with your choice of 14k gold filled bands or sterling silver bands for an additional $30 ($10 extra for each band in the set). If you would like either of these options for your mom bracelet set, select from options when ordering. 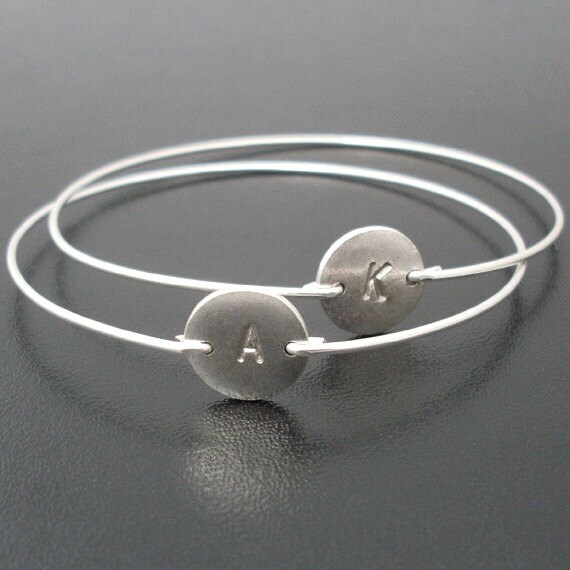 I can also add a FREE SECRET 2nd letter, number, heart, star, footprint or horseshoe on the back of the initial disc for your custom mom bracelet. Please specify in notes to seller during checkout. Also please note, I cannot add anything to the back of the oval as it can only handle stamping on one side. ***Please note this jewelry is intended for mommy only, and not for baby, as with any jewelry it could be a choking hazard if the stone somehow came loose. This custom mom jewelry makes for a great birthday gift for mom, or mother's day gift. I can blacken the initial as seen in the 3rd picture, or I can stamp the initial "clear" in gold or silver as seen in the rest of the pictures. However, I do "blacken the date" on this mom gift jewelry, because the numbers are thin and it stands out better. Plus I think it makes a very nice contrast with an un-blackened (clear) initial. If you do not want the date blackened, please specify in "notes to seller" during checkout for your personalized gift for mom. Please specify initial, blackened initial or not, birthday date, gold or silver, and size during checkout in notes to seller for your personalized mom birthday gift... 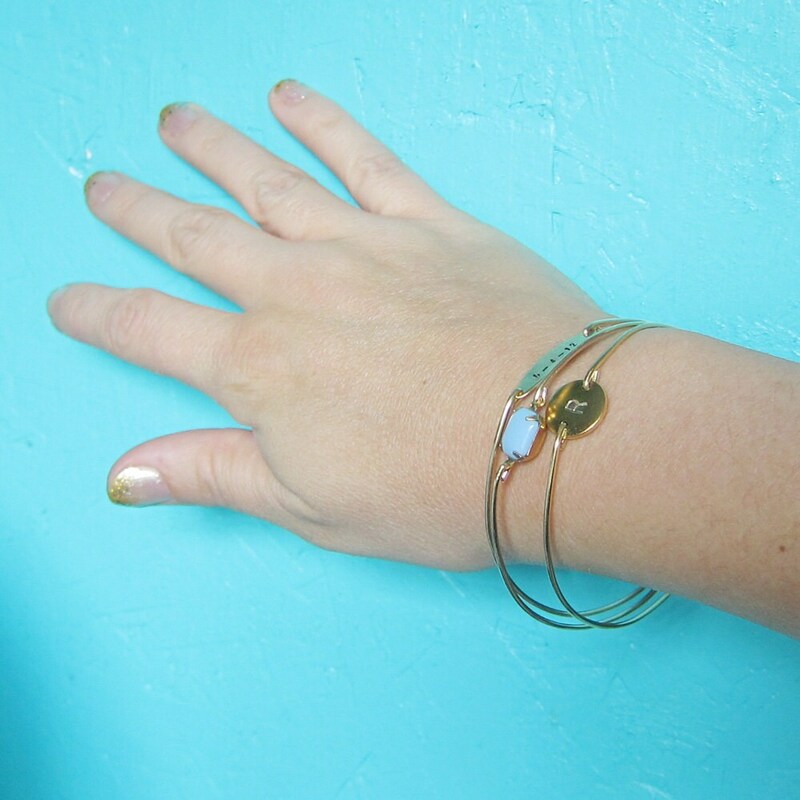 Choose from one of my regular sizes below by measuring one of your favorite bangles, or give me the circumference of the widest part of your hand where the bangle has to be pulled over; then I can size it for you. All of my bangles are closed and can’t be opened. Therefore, they have to fit over the hand. 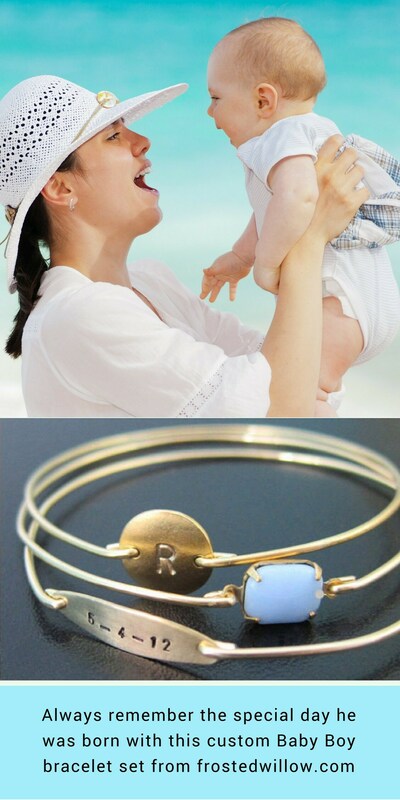 Custom: specify a custom size for your personalized mom bracelet. This personalized mom jewelry created and hand crafted with great care and love for you and yours. All of my items are special handmade creations that are original Frosted Willow designs. 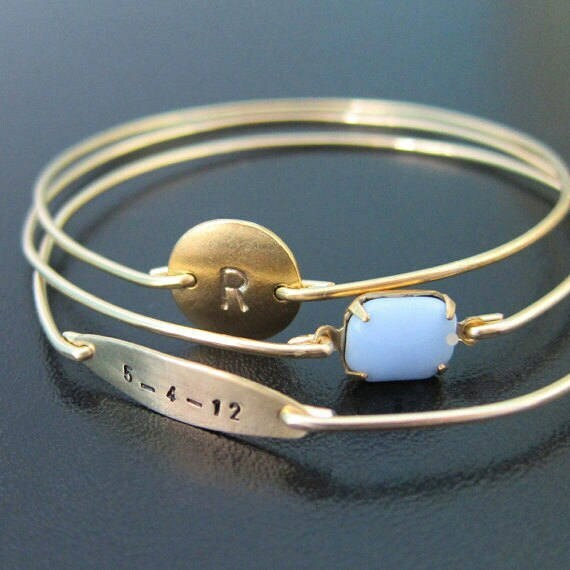 A combination of my © 2010 Anja Turquoise Bangle Bracelet & my © 2011 personalized initial and date bangles.